Perhaps best known in the UK for his game show Takeshi’s Castle, actor-director ‘Beat’ Takeshi Kitano is as enigmatic and multi-talented an artist as he is a prolific filmmaker. In the first of three Blu-ray releases this year, Third Window films brings us Kitano’s Hana-Bi (1997), a beautiful and unsettling study of violence and mortality, told through the eyes of ex-cop Nishi (Kitano). Nishi leaves the police force after his partner Horibe (Ren Ôsugi) is left paralysed in a shooting and spends his time caring for his wife while intermittently fending off Yakuza mobsters to whom he is indebted to the tune of millions of yen. The film’s English title, Fireworks, clues us in to its tone: fireworks are loud, bright and exciting, but also unpredictable, sometimes exploding unexpectedly in our faces, and sometimes not at all. Accordingly, Kitano plays with our expectations of violence, surprising us with unanticipated eruptions of blood and gunfire in one moment, and then cutting to its aftermath the next, leaving us to ponder what happened in the middle. Punctuating these brief moments of sturm und drang are extended, static shots, defined by their masterful use of silence, that seem to draw time out, just as the violence, frequently shown out of sequence, compresses time or disrupts its linearity. For Western audiences accustomed to the familiar rhythms of Scorsese, De Palma and McTiernan, this off-beat tempo is more in line with the European cinema of Ingmar Bergman than with gangster films. 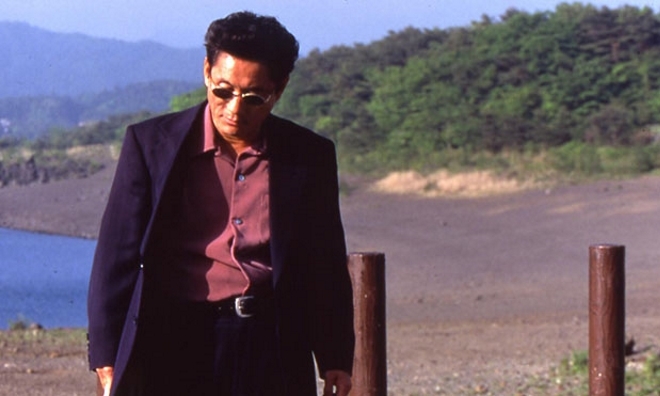 It may feel strange, languorous and even confusing, but it is the moments between the gunshots – the moments that the fuse extinguishes just before the rocket shoots into the sky – that is Kitano’s focus and those that he finds most devastating. Buried within Hana-Bi‘s deliberative style is a story of melancholy and existential frustration. Even the simple pleasure of watching a child play on the beach in the film’s final scene is tainted by the fact that she can’t get her kite to fly. It is a symbol of futility worsened by the fact that Nishi intentionally breaks the kite with what can only be described as comic vindictiveness, the action of a man standing in defiance of everything in the world, the good as well as the bad. While affecting and often beautifully articulated, the heavy nihilism allows very few moments of optimism to break through its hopeless fog. While this nihilism is at the heart of the film’s thesis, its downbeat story and deliberately slow-paced, static style can at times feel overwhelming. This is a film to be admired rather than enjoyed; with a melancholy that lingers long after its close and an unsettling lead performance from Kitano, Hana-Bi is a rare and unique portrayal of violence, futile anger and defiance.